Smith & Mills, where CB1 opposes the serving of alcohol at these four outdoor seats. Matt Abramcyk, co-owner of four bar-restaurants in Tribeca, got more than he bargained for when he went before Community Board 1 this month. What began as a routine request to alter two liquor licenses ended with the board threat­ening to end outdoor seating at the two establishments. The city’s Department of Consumer Affairs granted both licenses anyway—but Abramcyk and the Tribeca Com­mittee were destined to meet again, this time over a required approval to amend his liquor license so that he could serve alcohol to the outdoor customers (up to eight for each of the establishments). In a rancorous exchange with the com­mittee earlier this month, Abramcyk argued that he needed the seating at Smith & Mills to survive the impact of street work on North Moore. Months of scaffolding had also hurt his business, he said. “Since I got the sidewalk café license I could make money. Nobody’s bothered by it that I’ve spoken with,” said Abramcyk, who is also an owner of Super Linda and Warren 77 in Tribeca. 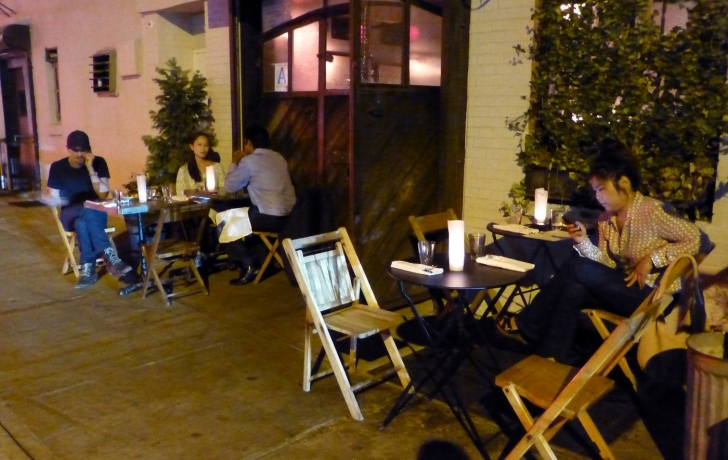 Abramcyk claimed unfair treatment, citing the outdoor seats across the street at Locanda Verde and next door at Ivy’s. Only committee member Adam Mal­itz called for a reconsideration of the board’s blanket rejection of all applications for sidewalk cafes on side streets. “I really think we need to discuss this policy on a merit basis,” he said. Abramcyk left the meeting visibly angry at the committee’s vote against his request for Smith & Mills. And then it only got worse for him. At the full board meeting, where the committee’s decision needed to be ratified, committee member Roger Byrom stood to make an announcement. “I passed Tiny’s tonight and there were four tables and eight seats and they were serving liquor,” he said. The assertion that alcohol was being served before the license had been amended set the board off. They reversed their prior decision that would have allowed Tiny’s to serve alcohol outside and now voted against outdoor alcohol service at both restaurants. Michael Levine, the board’s director of planning and land use, suggested that Coun­cilwoman Margaret Chin, through the City Council, could take away his outdoor seating licenses. “They’re the only ones who have the power to revoke a sidewalk café license if it’s not following the law,” he said. Chin’s spokeswoman, Kelly Magee, said in an email that her office is looking into any history of complaints or violations involving Abramcyk’s restaurants. “If an operator consistently violates their sidewalk cafe license, it is likely that the City Council member will call the operator in for a hearing and potentially not renew their permit to operate,” she said. The Council does not have the power to revoke a license, she said, only to block the renewal. Abramcyk did not attend the full board meeting and learned of its decision in a call from the Trib. “Un­believable,” he said, audibly stunned, and declined further comment.